One persistent irritation with my cycle route from London to Whitstable is the Medway Tunnel, which currently bans cyclists from using it, despite it effectively being a link between major long-distance NCN1 routes (Gravesend-Strood Canal and Chatham-Sittingbourne). What's especially bad is that this tunnel is a modern one, built in the 90s, so why does it not have provision for cyclists? 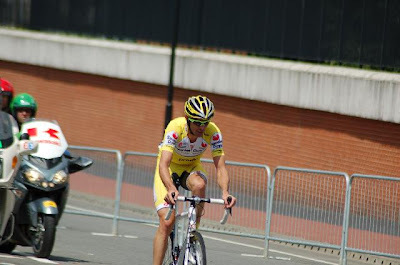 Particularly ironic is that when the Tour de France came through Kent in 2007, they shut the tunnel to road traffic and used it for the route! No such luck for regular cyclists though, we must use the alternative, which is to go over the chalk hills above Strood, or through the delightful large industrial estate, over the Rochester Bridge, and through Rochester and Chatham. The most important infrastructure issue from the consultation exercise is the provision of a cycle facility through the Medway Tunnel. Currently an Act of Parliament precludes cycling through the tunnel and the provision of a safe route is difficult to achieve without considerable financial implications. However, the omission of a link for cycling in this locality effectively divides Medway for a great number of cyclists and reduces cycling as a viable option for a large section of the community. This division is highlighted by the proximity of the University of Greenwich and Medway City Estate to the Medway Tunnel. However, the intimidating environment in the tunnel may discourage its use by inexperienced or nervous cyclists. * the likely additional ongoing maintenance costs and possible increased closure time for maintenance. So my reading of that was that they would have to go to the effort of doing some paper shuffling, and a bit of tinkering to the tunnel. By all accounts there is already a narrow pedestrian walkway at the edge which is wide enough for bikes, but currently has some obstacles which could be moved. Let's do it! Their alternative short-term solution is apparently to introduce a bike shuttle, which is ridiculous for the short length of tunnel. It does, however, recommend that an investigation be carried out to progress the recommendation. There doesn't appear to have been any progress in this matter subsequently. I will submit a complaint to the council soon and report back if I make any progress. The cycle consultation identified the need to allow cycling through the Medway Tunnel. In response to this request, cycling assessments have been undertaken at various speeds through the tunnel. 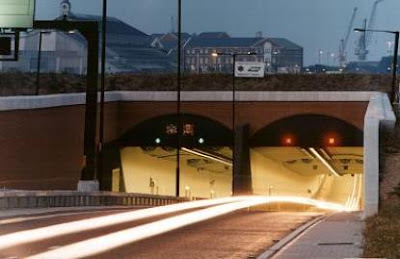 The assessment has established that, whilst cycling through the tunnel may be an attractive option for experienced cyclists, it is considered that potential and inexperienced cyclists would not be encouraged to use the route due to the potential risk to personal safety and the intimating nature of the enclosed environment. Therefore, it is considered that promoting a scheme to allow cycling through the Medway Tunnel would not significantly deliver Medway’s overarching cycling policy to “enable and encourage safer cycling among potential and inexperienced cyclists”. As a result, it is considered that the costs associated with the necessary physical and legal measures (including an Act of Parliament) would not offer value for money. Therefore, a scheme to allow cycling through the Medway Tunnel does not form part of the implementation programme. However, it is recognised that the river does cause severance to trips by cycle and Medway Council is keen to pursue actions to improve access by cycle across the river. Appropriate initiatives... include a short-term solution of a shuttle bus and a longer-term provision of a pedestrian/cyclist bridge." The shuttle bus option has been investigated, and a major obstacle to its implementation is to provide a suitable and safe drop off and collection point on the Medway City Estate side of the tunnel. Planning permission has been granted some years ago for a Park & Ride site in conjunction with a retail unit at Whitewall Creek on the Medway City Estate (by the McDonalds restaurant) which would provide an idea turning point. However this scheme is to be privately funded by developers and in the current climate no developer has come forward to progress the site. The idea of a combined footway/cycleway/public transport link between Chatham Centre and Medway City Estate is also a long term ambition of the council in conjunction with the redevelopment of Medway. Of course you have every right to make representation to a Medway councillor, and/or the local MPs regarding this on any other issue. Councillors' contact details are available on Medway Council's website. I am just beginning to find out the utter incompetence of Medway Council in respect of their progress on this issue. I don't know how connected you are to other cyclists in Medway but I'm thinking some sort of protest/campaign is needed. It's frustrating that the Medway tunnel isn't open to cyclists. I guess if it's not strictly enforced, then cycling on the pavement might be justified as long as you dismount for pedestrians. I don't think Medway police clamp down on cyclist on pavements. I think if it's necessary then it can be justified. You mention the Rochester bridge and the unpleasantness of the industrial estate. Have you considered the M2 bridge? There's quite a good cycle path that runs alongside it and is part of the North Downs Way. It might add a few extra miles to the route, but going south of Walderslade and cycling through the downs to Faversham and then following the coastal road to Whitstable is quite a pleasant ride. I'd be interested to know what route you take from London to Medway as I'm looking for a decent route into London myself.